Controversy surrounding the Romanian economy is nothing new, nor, as Manuel points out in his post on the recent election, are Romanian politics strangers to tumult. Nonetheless the intensity of controversy has grown considerably of late, with a wide variety of assessments being offered concerning the likely impact of the intensifying international credit crisis on the short to medium term outlook for the Romanian economy.National Bank of Romania (NBR) governor, Mugur Isarescu, has been consistently arguing that the country should be able to avoid an excessively "hard landing"as the bank attempts to cool its evidently overheated economy and engages of fire-extinguising activities in the banking sector trying to control the impact of set of adverse external circumstances that are largely beyond its control. But most of these comments (or at least the more convincing ones) preceded the meltdown in the international financial markets which followed the Lehman Brothers bankruptcy, the fallout from which has surely had a strong negative impact on Romania's economy and greatly complicated the task of conducting macroeconomic policy which faces the new government to be be formed following last weekends elections. The other complicating factor has been the "own goal" scored recently by the Romanian political process, with one politician after another proposing fiscal deficit raising policies, at just a time when the international financial markets have become extremely sensitive to just this development in countries which are, due to their large current account deficits, mainly dependent on external borrowing to finance their lending needs. The accommodative fiscal policy being run by the Romanian government has also been extremely ill advised at a time when the central bank was busy trying to cool overheating by applying a restrictive monetary policy. For policy to be coherent, the two main levers need to be operated in tandem, and not at cross purposes. 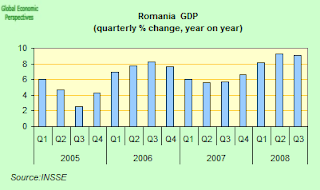 However, despite all odds, Romania has been hanging on in there, and GDP remained strong in the third quarter, a situation which has lead some commentators to use the term "gravity defiers" to describe those East European economies, like Romania and Bulgaria, that have so far avoided having a sharp adjustment, despite having evidently unsound macroeconomic fundamentals, and in particular unsustainably large external deficits. Not everyone has been convinced by the positive posture being assumed from within Romania, however, and Fitch Ratings agency had already downgraded Romania's outlook (together with that of the Baltic states and Bulgaria) from stable to negative by August pointing out in the process that the economy was extremely vulnerable to external financial pressure. This association of Romania with the Baltics is not incidental, since the Baltic economies were until only very recently - as Romania is now - the fastest growing in the European Union (with rapid credit expansion and large current-account deficit, sound familiar) but have subsequently experienced a very sharp growth slowdown following a sharp tightening in domestic credit demand and a dropping-off of external demand after high internal inflation fuelled by very large annual wage rises destroyed competitiveness. Indeed both Latvia and Estonia are now in deep recession, and have moved in a matter of months from being the EU's fastest growing to being the EU's most rapidly contracting economies. This is precisely what the expression "boom-bust" really means. The million dollar question at this point is whether or not the Romanian economy is destined to follow along the same path. In the analysis that follows I will basically be arguing that this is exactly where the Romanian economy is now headed. Some evidence to back the view can be seen in the latest reading on the EU economic confidence indicator (see below) which after months of trending slowly and steadily downwards suddenly lurched sharply south in October and November. Another detail which we would do well to bear in mind is that after many months of consecutive rises, seasonally adjusted retail sales fell in Romania (by 2.1%) in October over September. Indeed a growing quantity of anecdotal evidence now suggests that something important changed in Romania in October, even if we may yet need to wait several months to see the in the cold clear light of day the actual consequences of what happened. Another signal we have is that all is not exactly well, is that the number of newly-established companies increased only 0.7 percent in the year up to mid-November when compared with the same period last year, while bankruptcies soared according to the latest data from the Trade Registry Office (ONRC) - and in fact October was the month with most cases of insolvency, up a whopping 79 percent over October last year. In addition Romania's banks experienced a sharp liquidity crisis in mid October (see more below) and needed to borrow a total 49 billion lei (13 billion euros) in October from the central bank (using its lombard credit facility). This is 28 times the total amount borrowed between January and September 2008, according to NBR data. Banks only borrowed 20 million lei in lombard credits in September, while the total value of the loans issued was 1.75 billion lei between January and September. A capital-inflow-driven absorption boom has underpinned rapid catch-up growth but also fuelled macroeconomic imbalances. In particular, the external current-account deficit has risen to unsustainable levels. And, since mid-2007, headline CPI inflation has surged well above the central bank’s target, in part reflecting the firstround effects of food and energy price shocks. Rapid credit growth has raised risks to financial stability, although the largely foreign-owned banking system remains wellplaced to absorb shocks. In this setting, fiscal policy has been highly procyclical and lacked medium-term orientation. The IMF quote above basically spells out the general understanding economists have of what has been happening in Romania. Real GDP growth has been robust,but has increasingly been running up against capacity bottlenecks. Largescale emigration, notably to Italy and Spain, and high demand for workers, especially in construction, have resulted in tight labor market conditions. As a result, real wage growth has outpaced productivity growth, with buoyant public-sector wages adding to private-sector wage pressures. With core inflation under pressure, headline inflation has surged, partly owing to the firstround effects of shocks to energy and food prices, and to some extent reflecting the 2007 drought. However the initial shock has evidently moved over into second round effects, and price setters, faced with higher unit labor and other input costs, have been struggling to maintain their markups, as also indicated by surging producer-price inflation. It is in this context that the fact that fiscal policy stance in 2007 was highly procyclical becomes a problem. The fiscal deficit increased in 2007 to 2.25 percent of GDP, up from 0.5 percent of GDP in 2006. Adjusted for the automatic effects of the booming economy on the fiscal position, the IMF estimated that the 2007 structural deficit rose to almost 4 percent of GDP. As a result, the fiscal stance was highly expansionary, adding an estimated net fiscal stimulus of 2 percent of GDP to an already overheating economy. Thus the Romanian economy was simply booming along just waiting for something unfortunate to happen, and, of course, true to form and as was to be expected, it eventually did. Bank lending seems to have ground to a virtual halt in Romania in mid October (and October is the latest month for which we have statistics from the National Bank of Romania). After rising at a monthy rate of 4% (or a 50% annual rate) in September, total lending to households and non financial corporations actually fell in October (when compared with September) by 0.6%. For an economy which has been experiencing a debt driven consumer and construction boom it is hard to overstate the significance of this single fact. We seem to have what is known as a "sudden stop" in aggregate bank lending here, and the Romanian economy may now well fall rapidly into recession, following the tried and tested path so recently pioneered by Latvia and Estonia. While RON denominated lending continued to advance slightly, the largest hit appears to be being taken - not really surprisingly - by forex loans, which fell in total by 1.5% in total month on month (-1.9% corporates, -1.2% households). 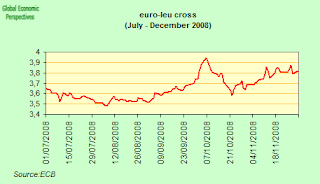 Given that the RON strengthened slightly against the euro during the month the decline was probably less than it appears (since the book value in RON of forex loans falls when the Leu strengthens - and vice versa - and this revaluation is of course the great danger represented by a sudden Leu slide, since not only will the monthly payments on the mortgages shoot up, so too will the capital value of the outstanding mortgage, as anyone unfortunate enough to have taken out a loan in Japanese Yen, or CHF, surely already knows to their cost). But basically, since the currency fluctuated wildly but was actually up against the euro by 1.5% in October, we really do need to wait till we get to see what happened in November to have a clearer picture. However, if we look back over the two months of September and October (where the currency fluctuations to some extent cancel each other out, but that overall the leu weakened 4.5% against the euro) then it is clear there has been a sharp slowdown in forex lending, and the effects of this slowdown will gradually be felt over the next six to nine months. Well, gradually or not so gradually, since new car sales (which obviously normally need finance) fell by nearly 30% year on year in October (to 20,478 from 29,347 a year earlier), according to the latest data from the Romanian Association of Automobile Producers & Importers. Basically if we look at the pattern which we can see in other economies which have been affected by the credit crunch, what started off as a slowdown in demand for cars as oil prices rose "transited" to an inability to finance purchases as oil prices fell back again. Hence the current difficulties of motor industry "majors" like Ford and General Motors. Romania's loose fiscal policy stance and the growing public spending commitments were among the key reasons cited by credit ratings agencies for the recent downgrades in Romanian debt to what is effectively 'junk' status. Indeed Finance Minister Varujan Vosganian recently estimated that spending increases authorised by parliament before last weeks elections could widen the budget deficit considerably beyond the EU’s 3% of GDP limit, and some estimates suggest that, on a worst case scenario, it could possibly even amount to as much as 7% of GDP in 2009. Indeed it looks as if the deficit could even pass the 3% level in 2008 (the year of such a rapid expansion, there is surely no excuse for this) since the 11 month budget deficit widened to 2.9% of GDP following a sharp drop in budget revenues over the last two months according to Varujan Vosganian last week. Vosganian told a press conference that budget revenues in October and November were 1.3 billion euros below the projected level. Perhaps the highest profile decision in the context of the recent Romanian fiscal deficit "cause celebre" was the one taken on 8 October by the Romanian Parliament, when it agreed to a pay rise for teachers which was calculated to be in the region of 50%, and this against the explicit wishes of Calin Popescu Tariceanu, the prime minister, who headed the then minority liberal government. The main worry arising from the teachers’ pay increase, aside from the concerns over how it will be funded, centres on the impact it will have on the pay demands of other public-sector workers and, in turn, of private-sector workers. 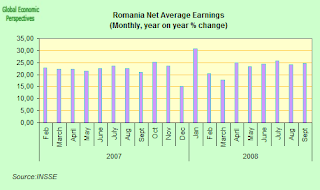 If such wage pressures are not resisted, then they will obviously only weaken further an already weakened Romanian competitiveness and in all probability would drive inflation back above the 10% mark in 2009. 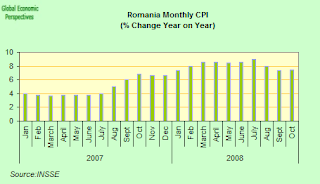 This would be the result in normal circumstances, but the Romanian economy is not in normal circumstances right now, and it is highly unlikely that the present credit crunch and the pressure from the international financial markets will leave time for this inflation spiral to run its course. Much more urgent matters are likely to make their presence felt first. Varujan Vosganian seems to be tirelessly explaining in the face of deaf ears that the proposed increase could push the budget deficit up in the direction of 7% of GDP in 2009, as no provision had been made to raise taxation, and the outgoing government issued an emergency ordinance on October 28th postponing the increase, following a warning from the IMF about the likely fiscal consequences. Defenders of the recent decisions, however, are quick to point out that Romania's accumulated public debt, at around 12% of GDP, is still extremely low. But this is to miss the force of the macroeconomic argument against running such annual deficits at time of high GDP growth. Basically, at this point, the Romanian economy has been overheating (and has not been stuck deep in recession), so the principal macro argument would be in favour of fiscal surpluses (and substantial ones, say 3% or 4% of GDP) to try and drain excess demand from the system. This is doubly the case when you look at the underlying difficulties of applying standard monetary policy (the central bank has been raising interest rates since to try and keep inflation better under control) in a context where foreign exchange denominated loans have been freely available at what effectively amount to negative interest rates. Although the government has made an effort to promote a more prudent fiscal policy, the temptation to win more voters has proved to be stronger. Consequently, the government decided to increase the benchmark index for calculating individual pensions by 20 % to RON 697.5 as of November earlier than originally planned. The benchmark index was already increased in November 2007 by 35 % and by another 7.5 % in January 2008. It will be further raised next January to complete the promised reform of the pension system aimed at bringing the average pension to 45 % of the average gross wage from the level of 35.5 % in November 2007. Doubtless we will soon here complaints about how "internation financial speculators" have brought the Romanian economy to its knees, but such voices would do a lot better looking at the degree of responsibility exercised by Romanian politicians in the face of the world's worst financial crisis in over 75 years, in a climate were concerns about procyclical fiscal deficits are known to be widespread. Inflation lies at the heart of the mechanism which has been steadily - via the expansionary fiscal posture - undoing the Romanian economy, and, right on cue, Romanian inflation increased again in October, hitting 7.4 percent, after dropping back to 7.3 percent in September. Consumer prices were up 1.1 percent month on month. In the Romanian context it is impossible to relate this inflationary pressure exclusively to rising energy and food costs, doubly so since these latter have now been falling steadily since July. The Romanian economy has been running at a much faster pace than it can comfortably sustain, and nowhere has this been clearer than in the strong upward pressure on wages, with net wages growing at an annual 24.6 percent in September while unemployment continued to hover near a 16-year low. In fact annual net wages increases have averaged around 24% over the last 6 months (see chart below), while real wage increases (allowing for inflation) have averaged around 15% throughout 2008. Monthly unemployment has been running at around 3.9% of the labour force (or 350,000 people) according to data from the Romanian Labour Ministry, or at around 5.9% according to the EU harmonised rate published by Eurostat (the difference between these two numbers is due to the different methodologies and criteria used). 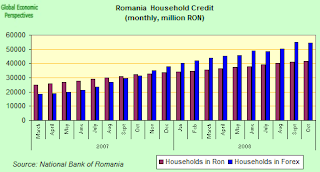 In either case these are historically quite low rates for the Romanian economy, and it needs to be borne in mind that there are at least a million Romanians (or another 10% of the labour force) working abroad (largely in Spain and Italy) most of them sending monthly remittances home to their families and relatives, remittances which in their turn fuel domestic demand, demand which the economy lacks sufficient capacity to meet without putting pressure on inflation. Of course, having made the point so forcefully about how much of a problem inflation has been in the Romanian economy, I think I should point out that this problem may well be set to disappear, or at least become somewhat less important in the general picture, should the Romanian slowdown prove to be as dramtic as I fear it might. We could move very rapidly from a situation of undercapacity and overheating to one of excess capacity, and sharp cooling as domestic demand folds and exports stagnate. Naturally everything depends on what happens to the Leu, since if we see a further substantial weakening in the currency this in itself will tend to add to inflation pressures, depending on how large a fall in the currency we are talking about. 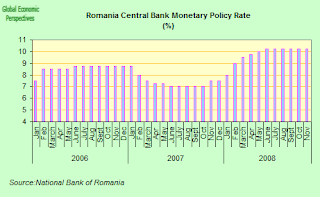 The Romania central bank which has been using monetary policy as best as it is able to try and fight the inflation threat, kept its key policy rate - which is the second highest in the EU after the 11% rate in Hungary - unchanged at 10.25% in October, although they did lowered reserve requirement on leu deposits (to 18% from 20%, as of November 24) in an attempt to ease the growing pressure on domestic liquidity which has been so evident since the mini financial crisis of mid October. Further monetary tightening (following the Hungarian example) might have seemed a more prudent strategy, particularly given the current comparatively low level of the real policy rate (only 2.75% above inflation), the continuing inflation pressures, the continuing loose fiscal stance and the recent credit rating downgrade from S&P. There is also the credibility issue to take into account, since Romanian inflation is still running well above the central bank year end target of 3.8%. On the other hand, if we take account of the rapid deterioration in the internal economic climate since October, then exercising caution may have been more sensible than it seems at first sight. The problem is that the Romanian central bank - like its Hungarian counterpart - is now caught between the need to protect the value of the Leu (given the prior level of forex borrowing) and the need to try to offset the rapid and dramatic decline in internal demand. In fact central bank Governor Mugur Isarescu argued that the bank responded to an "attack on the leu'' which had drained lei from the market and driven overnight interbank market rates sharply higher. The Banca Nationala a Romaniei sold 40 million euros on October 10 for lei on the interbank market and the Finance Ministry sold 291 million lei of three-year bonds on October 16. Overnight Interbank Bid Rates (ROBID) soared to 19 percent on October 17 (up from 16.53 percent on October 16) as banks frantically tried to get their hands on lei. Rates have subsequently come back down again, but at the start of December they were still hovering in the 12% to 13% range, well above the 7% to 8% range of January 2008, and also well above the 10.25% targeted central bank policy rate. Basically these rates seem to have gotten completely out of alignment with central bank policy towards the end of August, and there seems to be little evidence (or likelihood) that they will be coming back into line anytime in the near future (see the time series for yourself here - also anyone looking for a quick and handy list of banks with exposure to the Romanian market, the quoting banks for ROBOR are ABN Amro, Bancpost, Banca Transilvania, BRD Groupe Société Générale, BCR, CEC, EximBank, ING, Raiffeisen Bank and UniCredit Tiriac Bank). Some analysts question whether Romania can fin­ance its 59 billion euros in external debt without International Monetary Fund support of the kind secured by neighbours Hungary and Ukraine if such "attacks" continue to occur. The leu has now slipped 7 per cent against the euro since August, while the Romanian stockmarket is down 71% in the year to date and the leu has weakened by 21% against the US dollar over the same period. Romania's economy continues to put in a very strong performance and grew by an annual 9.1 percent in the third quarter, driven forward by the continuing consumption and lending boom, although most observers - including the the government - are agreed that all of this is now about to slow, and sharply. Indeed the government itself has forecast that growth will slow to about 4.5 percent next year, although others consider this to be rather overoptimistic under the circumstances and the big question is, just how "sharply" is sharply? Are we about to see one of those famous "hard landings"? There are reasons for believing that we may well be. At this point it is very hard to see just how far the economy actually slowed in the third quarter (at an annual rate it fell back from 9.3% to 9.1%, which really doesn't seem like very big beer), in the first place since we still lack detailed data, and in the second because don't publish or supply to Eurostat seasonally adjusted quarter on quarter data, which is really the most informative number we could get are hands on at this point, if it existed. So we are really stuck with "proxies" like short term retail sales data, and confidence indicators (unfortunately Romania doesn't seem to have much in the way of PMI surveys). Despite all this, you could say, couldn't you, that Romanian GDP growth still does look pretty robust. You could say this, that is, until you look at what actually happened to Latvian GDP growth following the onset of a credit crunch in that country. 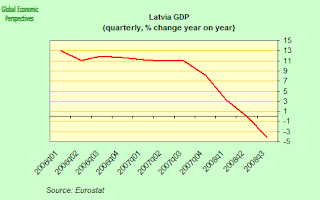 As we can see in the chart below, the Latvian economy was cruising along at a nifty 11% annual growth rate until the third quarter of 2007, at which point things started to go nastily wrong, and headline GDP growth fell off a cliff, reaching the dizzy low of around minus 5% a mere four quarters later. And of course Latvia is now stuck in a very, very deep slump. So just what happened? Well basically, the Latvian economy was being driven to grow way too fast by a rapid increase in foreign exchange credit. And Latvia, like Romania, had large numbers of workers outside the country, busily sending home remittances, while wage inflation at home went up and up. 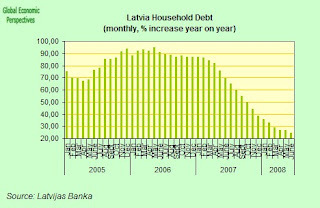 As we can see in the chart below, this credit was effectively cut back sharply in the spring of 2007, and down came the Latvian economy on the back of the cut. As we can see in the earlier chart I presented, year on year increases in Romanian forex lending have now been slowing since the mid summer, and I think it is not unreasonable to suggest that there is a strong danger of following the Latvian path, especially after the "short sharp shock" of mid-October. So just when will Romania enter recession? At this point it is hard to say, but if the Latvian pattern is anything to go by, negative year on year growth could arrive as early as Q3/Q4 2009, and we might even see quarter on quarter contractions starting with Q1 2009 (although we won't necessarily know this, since, as I say, the data we need simply isn't published). In response to this deteriorating outlook the outgoing government did announce a stimulus package, which is scheduled to take effect in January, and involves items like exempting reinvested dividends from a 16 percent tax, giving companies a bonus of 1,000 euros for every person they hire who has been unemployed for more than three months and faciliating 500 million euros worth of investments and other aid for farmers. There is also an allocatation of 3 billion euros for job-creating investments, lower social insurance payments and a 250 million-euro credit line for medium and small businesses via a cash injection into state-owned bank CEC. The government will grant aid of as much as 50 million euros to companies planning to invest more than 100 million euros and create at least 500 jobs, according to the plan. Investments of less than 100 million euros that generate at least 300 jobs stand to receive aid which could total up to 28 million euros. It will also give companies a 5 percent reduction in their tax bill in exchange for paying taxes on time and exempt new car sales for a year from a "pollution tax'' that ranges from 150 euros to 700 euros per car. But all of this is likely to be of little avail, since it is mainly small scale counter cyclical stimulus if the international financial standing of Romania continues to deteriorate. In late October the international ratings agency Standard & Poor’s (S&P) cut Romania’s long- and short-term foreign-currency sovereign credit ratings from BBB-/A-3 to BB+/B, and its local-currency long-term rating from BBB to BBB-. S&P pointing out the growing risks posed by high and rising private-sector leverage and dependency on an increasingly uncertain external financing channel. Given the size of Romania’s macroeconomic imbalances, they argued, the economy is highly vulnerable to any sudden tightening in external financial conditions which could cause a sharp downturn in economic growth. On November 10 Fitch followed suit, and downgraded Romanian debt - together with that of Bulgaria, Hungary and Kazakhstan - two notches to what is effectively 'junk' status (specifically BB+) as a result of their "concerns about the macroeconomic policy framework in Romania" and the country's ability to avoid a severe economic and financial crisis. Noting the widening current account deficit - which is expected to exceed 14% of GDP this year - a deficit which Fitch believes has been fuelled by excessive credit growth, the agency argued that a much stronger policy adjustment, especially in the fiscal policy area, would have been needed to avoid a currency crisis. Fitch specifically drew attention to the private sector foreign currency balance sheet mismatches, and argued that any imminent currency crisis would "require substantial external financial support from the international community to prevent a sovereign credit crisis." Fitch specifically singled out Emerging Europe as the most vulnerable Emerging Market region to the deterioration in the global financial and economic environment owing to the fact that so many countries have large current account deficits and relatively high levels of short-term external debt, and that these render them particularly susceptible to reduced capital and financial market flows (including from foreign parent banks). Since the onset of the credit crunch in August 2007, Fitch has now downgraded the foreign currency ratings of nine countries in emerging Europe (by a total of 11 notches), and this contrasts with just three upgrades that have been made over the same period. Eight countries are now on Negative Outlooks - which a record level for the region - while no countries are on Positive Outlooks, signalling that ratings remain under downward pressure. IMF Aid In The Pipeline? Obviously with the EU institutionally bogged down in its own issues of core and systemic bank bailouts, it is clear that the community's ability to offer meaningful assistance to Romania is going to be limited. Thus all eyes in Eastern Europe have been looking hopefully over in the direction of Washington, and the International Monetary Fund. The IMF has already offered aid to Hungary, Iceland, Serbia and Ukraine to help them cope with the difficult coktail of a credit drought, falling investment and shrinking government revenue. Romania, has so far not openly sought IMF help, although this does not mean that channels of communication and "dialogue" have not been opened. The sheer size of the current account deficit and the short term increase in the very sensitive area of government spending may make it increasingly difficult to fund the country’s $75 billion in external debt without IMF aid. In a statement to the local media, Juan Jose Fernandez-Ansola, the International Monetary Fund's (IMF) senior representative for Romania and Bulgaria recently observed that "The initiative to increase teachers' wages by 50% may need to be reconsidered. We estimate the impact on the budget would be modest in 2008, but would reach over 0.75% of GDP in 2009. In addition, if the increase were extended to other public sector employees, the impact could reach over 4% of GDP in 2009. This would send a wrong signal to financial markets." So it is not hard to see the kind of tack the IMF will be taking in any negotiations. However, there are important differences in the monetary systems of Romania on the one hand and the Baltic states and Bulgaria on the other, and these differences may facilitate rather than complicate the issue of IMF aid. The Baltics and Bulgaria all operate some variant of the currency board system, whereby the currencies are pegged to the euro at a fixed exchange rate (or within a narrow band), a feature which effectively prevents these economies from conducting their own independent monetary policy, thus placing the entire burden of macroeconomic adjustment on fiscal policy. The appreciation of the euro against the US dollar damaged the competitiveness of those economies vis-à-vis those economies whose currencies are linked to the dollar. Romania's managed-float on the exchange rate side has, in contrast, provided it with greater flexibility and some ability to utilise monetary policy as part of its macroeconomic stabilisation programme. Thus Romania has been able to resort to some degree of exchange rate depreciation to preserve external competitiveness over the past 12 months, while the central bank pushed up interest rates to keep real rates at positive levels and contain inflationary pressures. The complicating factor here has been the availability of substantial foreign exchange credit, at rates well below those imposed by the NBR. This has undoubtedly taken much of the cutting edge off central bank monetary policy in the short term, although as we are seeing, this supply of cheap credit has now, suddenly, "run dry". At the end of the day there is substantial agreement between all the main institutional actors (leaving aside Romania's own political class) - the NBR, the IMF, the EU Commission and the ECB - that Romania's external deficits are unsustainable in the long run; that fiscal policy has been ill-advisedly pro-cyclical; that wage growth has been excessive; that rapid credit-growth has been fuelling an unsustainable growth in consumption; and that a sharp and significant correction is now about to take place. This year's extremely good agricultural harvest has undoubtedly offered strong support to headline GDP growth in recent quarters, but this fortuitous virtuous circle may well repeat itself in 2009. On the other hand, the financial position of private households, after becoming ever more strained as domestic interest rates have steadily risen, together with the costs of servicing a growing volume of private debt, may well now deteriorate substantially as the lack of available credit and the rising layoffs in manufacturing industry exert an ever-tighter grip. In general terms, private consumption was already slowing before the onset of the credit crunch in October, and increased by 12.2 % yoy in Q2, following the record high of 14.3 % yoy in Q1. Investments also continued at a strong pace in Q2, driven mainly by new construction projects (up 34.8 % yoy), while investments in equipment was already slowing (down to 23.8 % yoy in Q2). In the first half of the year the construction sector absorbed 20 % of total investments in the economy, and it is this sector which will now be particularly hard hit. Slowing construction activity is now expected for the rest of the year, and should become more pronounced as we enter 2009 and new project steadily dry up. Prices of new housing and real estate transactions generally have been losing momentum in recent months, especially in the capital city Bucharest. This slowdown can also be observed in the national construction activity index, which has seen the value of construction works drop to an annual 19.1 percent rise in October (down from 28.3 percent in September, and down even further from the average 33 % yoy increase registered in the first half of 2008) . Month on month, construction growth slowed to 5 percent in October from 8.5 percent in September. More importantly, the number of new building permits issued has now been showing a steady monthly decline. Evidently the volume of construction activity continues to rise (even if at a slower pace) since existing projects need to be completed - credit crunch or no credit crunch, and regardless of whether there will actually be buyers for the completed properties. But at some stage activity may well grind to a near halt, as the appetite for new building projects suddenly evaporates. This is what we have seen in other similarly affected economies, and there is no good reason why Romania should be any different here. This view is reflected in the recent press statements made by Gabor Futo, executive manager of real estate developer Futureal Group. Futo takes the view that no new real estate projects will be started in the next two years and that 90 percent of the forthcoming ones already announced will be called off for lack of financing. Futo testifies to the way in which banks are now much more cautious in making loans and how developers are experiencing increasing difficulties in obtaining financing. Futureal recently started work on the new commercial center "Gold Plaza" in the northern city of Baia Mare. The center will have 30,000 square meters - all of them available for rent. The project aims to be completed in the first quarter of 2009 and will cost about 97 million euros. The company is a leading developer in Central and Eastern Europe, with projects worth more than 1.6 billion euros, including more than 6,000 residential units and some 500,000 square meters of commercial area. And, of course, it isn't only the construction sector which is getting hit. Since the problem is the availability of credit rather than interest rates per se, then anything which can't simply be bought on a credit card will be affected, and first in line here is the Romanian auto industry which could register its first bankruptcies towards the end of the first half of 2009 according to Alin Tapalaga, Manager of Porsche Inter Auto, the retail division of the Porsche Romania . Tapalaga feels the most affected companies will be those who have recently built showrooms, and especially in the past year using bank loans as finance,. The Romanian banks themselves are expecting a massive drop in lending to individuals in the last quarter of the year, especially for mortgage loans, despite forecasts of cheaper land and properties, following a worsening in lending conditions, according to a recent survey carried out by the central bank. Not surprsiningly, credit cards are the only lending product for which banks expect to see a slight increase in use in the last quarter, but even here they expect a much smaller increase than the one registered between July and September 2008. And all this reticence to spend comes despite (or perhaps because of) the fact that property prices are now falling. Three-room apartments in Bucharest have fallen by around 15 percent since the beginning of the year according to the the ZF real estate index. ZF suggest that prices nationally have dropped by 2 percent to 3 percent over the last six months, following stagnation or even slight increases earlier in the year. ZF compile their index by analysing prices asked by sellers on the anuntul.ro website. The value at which the deal is actually closed may be as much as 20 percent below the asking price they say. Whereas a typical seller was asking an average of 140,000 euros for a 70-square metre three-room apartment in January, the price reached 118,000 euros in November, or over 20,000 euros less. The sharpest monthly decline was registered in November, when the average price per square metre reached 1,686 euros, 5 percent lower than in October, according to the ZF analysis. Exporting Your Way Out Of Trouble? 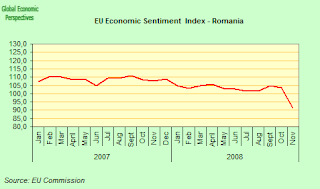 With domestic demand now set to fall sharply, as people buy less property and large ticket items, while companies prune back investment in response, the only way forward for Romania to achieve economic growth - and pay off its debts - would appear to be through exports, since the fiscal policy arm has, as we have seen, been basically frittered away during the good times. But here we hit a big snag, since Romania runs a large goods and services trade deficit. 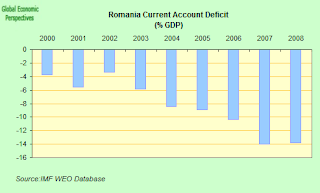 In fact, between January and September 2008, Romania's balance-of-payments current account posted a deficit of 12.7 billion euros, up 14.8 percent over January-September 2007. The deterioration was largely a result of the wider trade deficit (13.7 billion euros), which was up 11.7 percent over the same period of last year. On the positive side exports did grow (19.4%) more rapidly than imports, but that will be of little consolation if exports need to drive an economy where domestic demand is either flat (best case) or declining. And funding this deficit could become increasingly problematic, since foreign direct investment now covers only around one third of the gap in the current account, which means that foreign debt is on a strong upward spiral. Effectively this situation makes Romania susceptible to capital outflows in the medium term, and, were this to happen it would trigger a harsh real adjustment for Romania's economy and its citizens. Romania needs to attract capital inflows (including FDI) in the region of 15 billion euros per year to cover a current-account deficit which is expected to exceed 13% of GDP. In 2008 alone it is estimated that the net external indebtedness of Romania will rise by some 6 billion euros. Non-publicly guaranteed external debt came in at 31.501 billion euros at the end of September, up 25.9 percent from year-end 2007. The NBR has, of course, built up a strong foreign exchange reserves (27 billion euros at the end of November, or around 8 months imports) and can more than likely ride out the change in market sentiment in the short run. Also foreign direct investment of 7.2 billion euros covered 56.6 percent of the current account deficit over the January-September period, with equity stakes and reinvested earnings making up 52.7 percent of the total, while intra group loans accounted for the other 47.3 percent. But at the end of the day, having the reserves to ride out the crisis (with or without the aid of the EU and the IMF) isn't really the problem. The problem is how you turn a credit-driven internal-demand-boom economy into one where new-found export competitiveness means external demand drives growth. And how you do this, while protecting all those heavily-forex-leveraged households form the more or less inevitable downward correction in the value of the leu. Obviously the path from one point to the other passes through a hell of a lot of what we economists call "creative destruction", but lets just hope for the sake of all those who have to live through this "correction" inside Romania don't find the whole process a far too painful one.